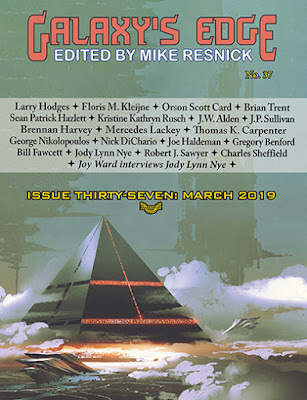 Issue 37 of Galaxy's Edge Magazine, which released this month, features a short story of mine called The Star Beneath the Staircase. Give it a read here. The Star Beneath the Staircase is a little on the dreamy, surreal side compared to much of my work. It's about a young child with an abusive father, who finds solace and comfort in a strange discovery. I hope you enjoy it. Galaxy’s Edge is a bi-monthly online magazine published every January, March, May, July, September and November. Select material from the magazine is free for online viewing. Downloads in multiple formats are available from a variety of different venues. A paper edition is also available from many online retailers, including Amazon.com. The magazine is a venture of Phoenix Pick, the science fiction and fantasy imprint of Arc Manor Publishers. The magazine is edited by Mike Resnick and published by Shahid Mahmud.